﻿ 3 Strategies to Turn Abandoning Visitors into Subscribers » Red Mango Marketing! Did you know that seven out of 10 visitors who abandon your site never return? That means if you’re not taking measures to connect with your abandoning visitors, you’re wasting your marketing budget and efforts. 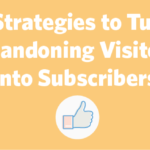 Let’s take a look at three different ways to turn your abandoning visitors into subscribers. Using an exit-intent popup is the best way to turn your abandoning visitors into subscribers. An exit-intent popup detects whether the visitor is leaving your site and prompts them with a targeted campaign to turn them into subscribers. Unlike typical popups, exit-intent popups aren’t annoying since they don’t interrupt your visitor while they’re browsing your site, but trigger only when they’re about to leave. However, even if an exit popup annoyed your abandoning visitor, there is no harm in trying because you were about to lose that lead anyway. In fact, exit intents are proven to recover 10-15% of lost visitors, so if you’re not yet in the exit-intent bandwagon to grow your email list, you might want to give it a try. With OptinMonster, you can create a personalized exit-intent popup addressing the needs and concerns of your visitors, which can even boost your conversion rate. Constant Contact has also introduced its new popup forms feature to capture web visitor attention and create more sales potential. If a visitor has spent time on your products page, for example, you may want to offer a discount coupon in exchange for their email address. Similarly, if a visitor is leaving from a blog post, you can offer a different lead magnet that incentivizes potential buyers in exchange for their contact information. When you create an offer for your exit-intent popup, it’s vital to consider the buyer’s journey. This way, you can offer a lead magnet that you know your visitors will love to consume. This mindset of considering your buyer’s journey will help you convert even more visitors into subscribers. It’s common to have higher bounce rates on your blog posts compared to other pages on your website. This is mainly because readers tend to leave your site after consuming the information they’re looking for. Now, you won’t always be able to convert your visitors into subscribers if they don’t engage enough on your site. Before you ask visitors to subscribe to your email list, you might want to make them more engaged so they spend more time on your site. The longer you can keep your visitors on your site, the more engaged they’ll be, and the more likely they’ll get converted to your subscriber. Suggesting related posts is a great strategy to reduce your bounce rate and have your visitors spend more time on your site. You might even use enticing images that grab their attention and relate specifically to the post topic. More than half of your visitors spend less than 15 seconds on your website. This stat clearly shows that people rarely read content word-for-word, and instead, skim through the page quickly. If your content is hard to scan, it will likely annoy your readers, making them leave your site too soon. To make your content more scannable, break up your content and use bulleted lists wherever necessary. After reading a blog post, chances are your visitors won’t have an idea of what to do next. So, it’s the perfect time to persuade your visitors to take action. You can add a simple opt-in form at the end of each post and encourage them to subscribe to your list. While adding a simple opt-in form at the end of each post is an easy way to net a few subscribers, you can exponentially grow your list by providing a post-specific lead magnet at the end of every post, known as a content upgrade. A content upgrade is a post-specific, opt-in offer that exists within or at the end of your article in return for a visitor’s email address. Although you need to spend your time on creating a post-specific offer, it is totally worth the investment for the result it produces. Unlike typical offers that provide generic resources like eBooks, content upgrades are highly targeted resources for your readers that offer exactly what they’re looking for in that moment. For example, if you publish an article on weight loss, you can offer visitors a PDF eBook on the same topic so that they can access the content offline. As targeted resources that are crafted specifically for certain pages, content upgrades are more likely to boost email signups. Visitors tend to ignore opt-ins displayed on your blog posts due to banner blindness. Since the content upgrade offer is typically placed in a highlighted text within the post area or at the end of your blog post, they’ll often easily grab the attention of your visitors. When a visitor clicks on a link inside the highlighted text, it pops out a form, resulting in boosting conversions. With a bit of due diligence, and following the above tips, you can turn your abandoning visitors into subscribers in no time! The post 3 Strategies to Turn Abandoning Visitors into Subscribers appeared first on Constant Contact Blogs. This entry was posted on Monday, November 27th, 2017 at 2:47 pm	and is filed under Email Marketing, List Growth, News & Updates. You can follow any responses to this entry through the RSS 2.0 feed. Both comments and pings are currently closed.